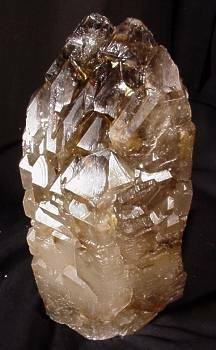 I first came upon elestial crystals in 1988, and was instantly drawn not only to their often strange appearance but to the energies and dimensions of being I could access by attuning with them. Perhaps it is best described as being slowly drawn deep within my psyche and the Earth, and then transported to transcendent realms. Also known as skeletal quartz, elestials have only emerged fairly recently. They are found at greater depths than other crystals, and it was not until the top levels had been mined that they appeared. They grow in family pockets — ones from a particular area or vein are similar, whilst their neighbors can be quite different. All have an affinity for water, and most have mysterious etching on their surfaces. Occasionally one may even have a moving water bubble, trapped ages ago, within a labyrinthine chamber. Found mainly in the Minas Gerais area of Brazil, most are smoky but some are citrine, white, or a combination of all three (tricolor). It is possible to see the layers of growth over eons of time within those that are clear, which is where the term skeletal quartz comes from. It is amazing to contemplate the processes that formed them over millions of years, revealed in the crystalline structure. Elestials come in various types and shapes. This includes scepters, wands, double-terminated, overlaid, plates, and floaters. Some are self-healed — they have grown new terminations in the area that was broken off during growth or mining. They can also have inclusions, whether clay or other minerals such as mica and tourmaline. And some have extrusions, small crystals attached to the larger one. Especially aligned with the energies and consciousness of Pluto and Scorpio, emergence at this time signifies their ability to connect one to new insights and information from multidimensional levels of awareness. Individual crystals may also have affinities with other zodiacal and planetary forces, usually depending upon type, shape, and color. Meditating with them usually brings me a feeling of deep peace and relaxation, along with an acceptance of things as they are, whether in my personal life, society, or the world. Placing them in various areas around my home also helps in keeping the space clear and open, as they absorb and transmute negative vibrations. Elestials also have the ability to bring things long hidden or repressed to the surface, and so a certain caution needs to be used in working with them. One has to be ready to face past feelings, emotions, and memories that need to be transformed, in order to move further along the spiritual path. In this regard they can be very healing. Through working with them, particularly a select few, I have been able to access information and understanding relative to astrology, crystals, the mystery tradition, and the transformational process. This has influenced my painting and writing, expanded perceptions, and increased love and compassion. They have been wonderful companions on the journey. In addition to attuning and meditating with single crystals, I also use them in grids. I recently added some to our outdoor medicine circle, and almost immediately felt an increase in the energy generated. The best way to experience the unique qualities of elestials is to find one that speaks to you, and spend time with it. The rewards can be enormous.